Trump Unleashes Wild Tweetstorm Over Don McGahn - Joe.My.God. 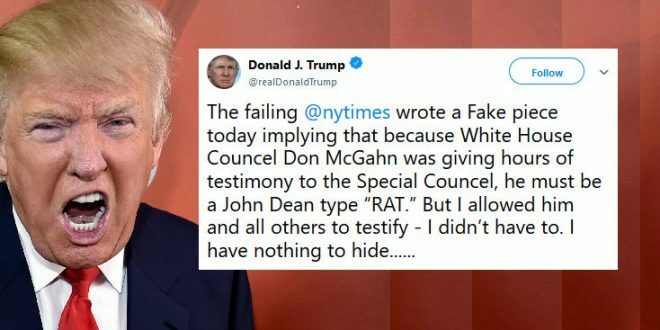 President Trump early Sunday attacked the “failing” New York Times for a report that he said implied White House counsel Don McGahn must be a “John Dean type RAT.” Trump said late Saturday that McGahn is cooperating with special counsel Robert Mueller’s investigation on questions about possible obstruction of justice because Trump “allowed” him to. The New York Times reported earlier that McGahn gave over 30 hours of testimony to investigators. The newspaper said that McGahn had grown concerned that Trump was preparing to set him up for a fall over the issue of possible obstruction of justice, prompting him to provide as much information as possible to Mueller’s investigation.